Refusing to react to Yogi Adityanath’s request to host the event, the CMO official said the CM will react only after the Ministry of Defence makes a formal announcement. 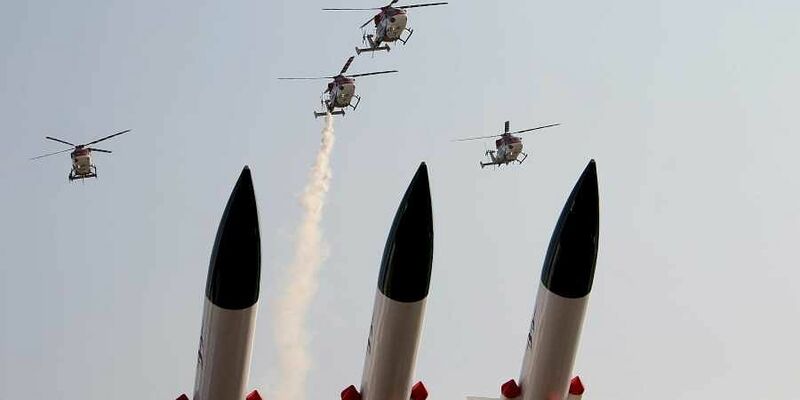 BENGALURU/ALIGARH: Amid speculation that aerospace exposition Aero India will be moved from Bengaluru to Lucknow, Uttar Pradesh Chief Minister Yogi Adityanath on Saturday made a formal request to Defence Minister Nirmala Sitharaman to host the next edition of the show in that state. Speaking after launching projects under the UP Defence Corridor in Aligarh, Yogi Adityanath requested the defence minister to allow UP to host the air show. “We will provide every type of facility. In this context, I request her to announce this at the earliest so that we can proceed with the preparations,” the UP Chief Minister said. However, Nirmala Sitharaman made no announcement in this regard. During his meeting with the defence minister, Kumaraswamy had requested that it should be continued in Bengaluru. However, while addressing a joint press conference with the Chief Minister, the defence minister had stated that MoD has not taken any decision on the date and venue of the event. Meanwhile, Deputy Chief Minister G Parameshwara and Revenue Minister R V Deshpande said that reports of Aero India being moved out of Bengaluru are very unfortunate. “We have been a defence hub since independence, but under the NDA we are constantly losing key defence projects and flagship programmes,” Parameshwara said. He urged the defence minister to clarify her stand on the issue. Deshpande, who was in Delhi on Saturday, took up the issue with Union Home Minister Rajnath Singh. “Karnataka is the aerospace capital of India, a pioneer in the contribution of high tech ecosystem to the Indian aerospace industry by attracting 65 per cent of aerospace investments and producing a quarter of India’s aircraft and spacecraft,” he said. Deshpande urged the defence minister to continue the show in Bengaluru, which has been hosting the biennial Airshow successfully for the past 20 years. Meanwhile, Congress, which is part of the coalition government headed by JD (S) leader H D Kumaraswamy, slammed the MoD’s plans to shift the event to UP. “Well done @nsitharaman ji. You’ve served Karnataka well for electing you to RS. In the #RafaleScam our HAL was sidelined to help a private individual & and now Bengaluru’s pride, the #Aero India is being shifted to Lucknow. Keep up the good work” KPCC president Dinesh Gundu Rao tweeted reacting to reports about MoD’s plans to move the show to UP. Rao and other Congress leaders from the state have earlier written to the defence minister urging her not to shift the show from Bengaluru. The air show that first started in Bengaluru in 1996 has grown into one of the major aerospace expositions in Asia. A number of foreign and domestic firms take part in the biennial event held at the Air Force station Yelahanka. According to aerospace experts, Bengaluru is the best venue to host the show as a number of defence and aerospace firms are located in the city.